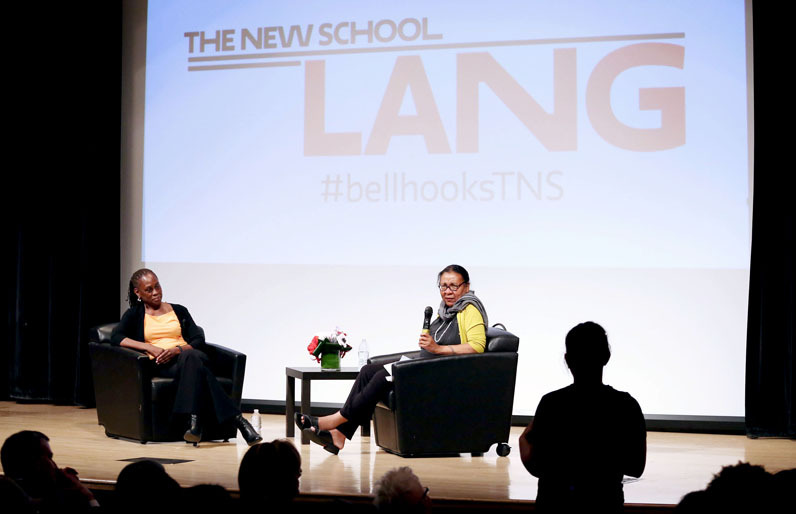 bell hooks leads a discussion with New York City First Lady Chirlane McCray during hooks' three-year residency at Eugene Lang College. Photo by Jonathan Grassi. Over the course of her three-year residency at The New School’s Eugene Lang College, feminist author and scholar bell hooks has fundamentally challenged the cultural norms and ideas that structure our society. Who can forget the time she called Beyoncé a terrorist? Or, the time she pointedly asked Laverne Cox if she was perpetuating gender stereotypes? Or, the occasion when, in a discussion with Gloria Steinem, she critiqued second wave feminism, a movement she has come to represent? hooks’ public lectures at The New School (15 and counting) have been an enlightening—and at times provocative—educational experience, one that continues October 5-9 through conversations with artist Theaster Gates, political activist Kevin Powell, and New York Times columnist Charles Blow, among other guests. It will be hooks’ fourth and final visit to The New School as part of her scholar-in-residence-program with Lang College. hooks’ articles, works, and theories are already required reading for many Eugene Lang College students. But, to prepare them for her last residency, we asked the scholar herself what books she recommends to young and old learners alike to prepare them to critically think about the world.